Aug 30, 2018; Glendale, AZ, USA; Denver Broncos punter Marquette King (1) against the Arizona Cardinals during a pre season game at University of Phoenix Stadium. Colby Wadman will punt in his first NFL game Sunday against the New York Jets at MetLife Stadium in East Rutherford, N.J.
JERSEY CITY, N.Y. – There will be no part II for Marquette King, at least not as a member of the Denver Broncos. The punter was placed on injured reserve Saturday with the team telling King he will be released as soon as he’s healthy. The Broncos made their expected corresponding move official Saturday by promoting punter Colby Wadman from their practice squad. Wadman will punt in his first NFL game Sunday against the New York Jets at MetLife Stadium in East Rutherford, N.J.
King missed the past week of practice with a groin injury, but lack of performance is the reason the team is letting him go. Broncos head coach Vance Joseph and special teams coordinator Tom McMahon said this week they didn’t believe King’s performance was due to the injury. King’s agent Wynn Silberman has a different take as he’s sending his client to get checked out by Dr. Kalle Stidham in San Jose on Monday. King boomed the ball in the first half of training camp, but he started struggling with consistency during the preseason and into the regular season. After averaging 51.0 yards a punt against his former Oakland Raiders in week 2, King posted a video on social media that spoofed Jon Gruden, the Raiders’ coach who released him in March. The video included #part1 and a Chucky doll, which has become Gruden’s personal mascot of sorts over the years. Part II presumably was to be posted after the Broncos played the Raiders on Christmas Eve night in Oakland, but King won’t be around. He punted miserably in the rain two weeks ago at Baltimore and two more poor punts Monday night against the Kansas City Chiefs, as became known King was particularly ineffective when rushed. The Broncos signed King to a three-year, $6 million contract (with only this season and $2 million guaranteed) in early April and traded their punter of the previous two years, Riley Dixon, to the New York Giants in exchange for a 2019 seventh-round draft pick. The Broncos made the swap because they wanted more length on their punts when delivered from inside their 35-yard line or so. 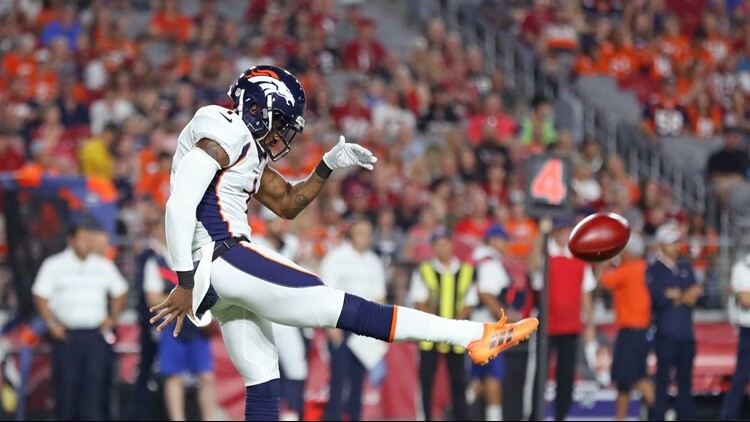 But even with three of his four games in the rarified air of Broncos Stadium at Mile High, King ranked 22nd in the league with a 44.1-yard gross punting average (Dixon is 9th 47.8) and 20th with a 39.7-yard net (Dixon is 12th at 41.0).